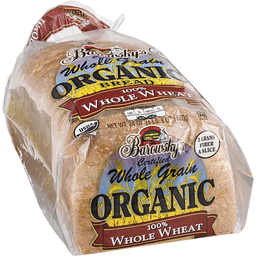 Barowsky's® 100% Whole Wheat Organic Bread. Baked with organic honey. Certified whole grain. USDA organic. Per 1 slice serving. 100 calories. 0g sat fat, 0% DV. 180mg sodium, 7% DV. 3g sugars. Barowsky's. Organic 100% Whole Wheat Bread reflects old-world baking traditions, with 100% organic flour as our premium quality starting ingredient plus a selection of delightfully delicious "pinches" from the baker's cupboard. The consistent care and baking skill required to create this amazingly healthful and great tasting, organic bread is a testament to the Barowsky's. Organic commitment to the finest quality. All of our Barowsky's "Certified Organic" bakery products meet strictly defined standards, guaranteeing ingredients are grown using sustainable farming practices that enhance ecological harmony and rely on nature's balanced systems. 3 grams fiber a slice. Organic 100% whole wheat. Certified organic by QAI Inc. Quality Assurance International. Certified organic. 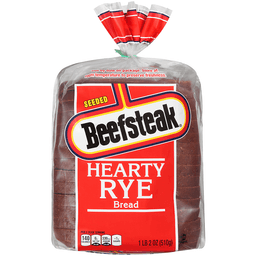 Beefsteak® Pumpernickel Bread. Per 2 sauce serving: 150 calories. 0g sat fat, 0% DV. 350mg sodium, 15% DV. 2g sugars. 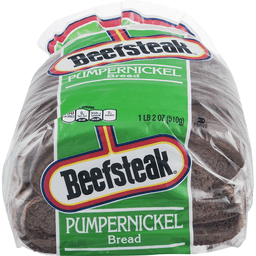 Beefsteak breads, like this tangy and robust pumpernickel, are baked with great care from quality ingredients. 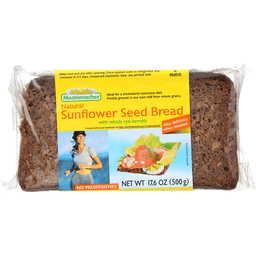 Enjoy the taste of Beefsteak Pumpernickel bread and make any meal special. We are committed to providing you with quality products and welcome your questions and comments. Call 1-800-984-0989, consumer relations department. When writing, please include the "best by" date and coding as well as the bar code and numbers. ©All rights reserved. 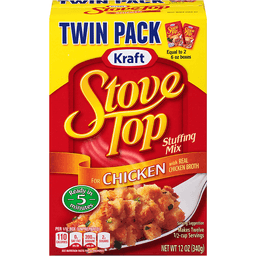 Kraft Stove Top Stuffing Mix for Chicken. Twin pack. Equal to 2 6 oz boxes. Kraft. Stove top. For chicken with real chicken broth. Ready in 5 minutes. Per 1/12 box (unprepared): 110 calories. 0g sat fat, 0% DV. 390mg sodium, 16% DV. 2g sugars. Makes twelve 1/2-cup servings. Carton made from 100% recycled paperboard. Minimum 35% post-consumer content. 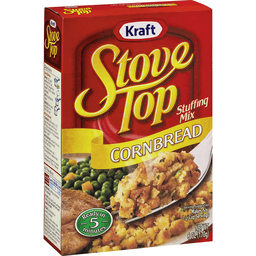 Discover more Stove Top meal ideas at stovetop.com. Visit us at: kraftfoods.com. 1-800-431-1003. Please have package available. ©Kraft Foods. 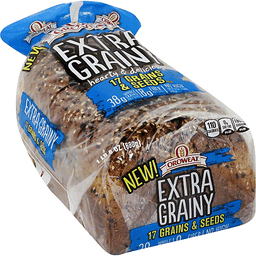 Arnold® Extra Grainy Bread 17 Grains & Seeds. Est. 1940. 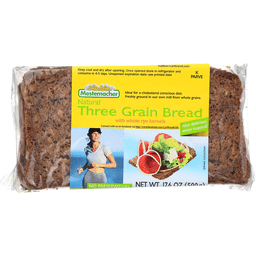 38g Whole grains per 2 slices. 8g Fiber per 2 slices. No high fructose corn syrup. Per 1 slice serving: 110 Calories. 0g Sat fat, 0% DV. 180mg Sodium, 8% DV. 3g Sugars. Net Wt 1 lb 8 oz (680 g). Go with the grain.™ Deliciously baked with the goodness of grains, our whole grains breads are a simple choice that supports your goal of living a balanced life. No artificial colors or flavors. 0g Trans fat. Whole grains are any grain that includes 100% of the original kernel. The USDA and whole grains council recommends 48g of whole grains per day to ensure you get the nutritional benefits of whole grains. Whole Grain - 19g or more per serving. Eat 48g or more of whole grains daily. Arnold is a registered trademark of Arnold Sales Company, LLC used with permission. We are committed to providing you with quality products and welcome your Questions and Comments. Consumer Relations Department, Call: 1-800-984-0989. When writing, please include proof-of-purchase (bar code) and stamped date code. For great recipes made with delicious Arnold bread, Visit us at www.arnoldbread.com. © All rights reserved. 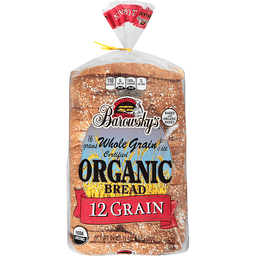 Barowsky's® Whole Grain Organic Bread. 3 Grams fiber per slice. 12 Grain. 15 Grams whole grain per slice. Certified organic. Barowsky's organic 12 grain bread reflects old-world baking traditions, with 100% Organic flour as our premium quality starting ingredient plus a selection of delightfully delicious "pinches" from the baker's cupboard: rye flakes, oats, barley flakes, sunflower seeds, flaxseeds, honey, and others. 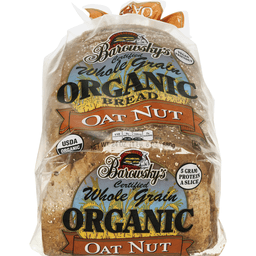 The consistent care and baking skill required to create this amazingly great tasting, organic bread is a testament to the Barowsky's organic commitment to the finest quality. Certified organic by QAI Inc. Quality Assurance International, certified organic. Per 1 slice: 110 Calories. 0g sat fat, 0% DV. 220mg sodium, 9% DV. 2g sugars. Baked with organic honey. Organic bread. USDA Organic. All of our Barowsky's "certified organic" bakery products meet strictly defined standards, guaranteeing ingredients are grown using sustainable farming practices that enhance ecological harmony and rely on nature's balanced systems. 6 enriched rolls. Since 1931. Bakery. Welcome to Tradition. 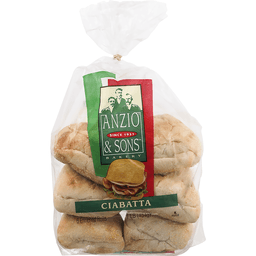 These delicious deli-style baked goods continue the Anzio & Sons heritage of quality and taste. 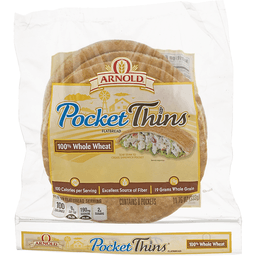 They're the perfect choice for special sandwiches, fast meals, or quick snacks on the weekend. Just choose your favorite, and enjoy. Buon appetitto from Anzio and Sons. A tradition of goodness. Per 1 Roll Serving: 210 calories; 0 g sat fat (0% DV); 460 mg sodium (20% DV); 0 g total sugars. We are committed to providing you with quality products and welcome your questions and comments. Call 1-800-984-0989, consumer relations department. When writing, please include the proof-of-purchase (bar code) and stamped date code. 11 g of whole grain. No high fructose corn syrup. No artificial colors or flavors. Per 1 Slice Serving: 60 calories; 0 g sat fat (0% DV); 110 mg sodium (5% DV); 2 g total sugars. Whole Grain: 11 g or more per serving. Eat 48 g or more of whole grains daily. WholeGrainsCouncil.org. Bread is low fat, cholesterol free food. 0 grams of trans fat per serving. You know that good nutrition only words its magic when it's something your kids will actually eat. 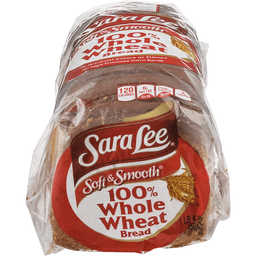 That's why families love Sara Lee soft & smooth 100% whole wheat bread. Kids love its soft texture and mild flavor. Parents love that is has whole grain, calcium and no high fructose corn syrup. How did something so yummy, get so nutritious? We are committed to providing you with quality products and welcome your questions and comments. Call 1-800-984-0989, Consumer Relations Department. When writing, please include the proof-of-purchase (bar code) and stamped date code. Like us on Facebook facebook.com/saraleebread. 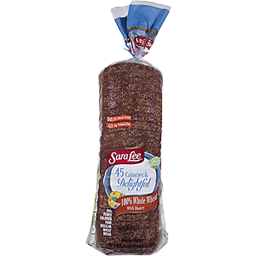 www.saraleebread.com. Good source of folic acid. No high fructose corn syrup. 0 g trans fat. No artificial colors or flavors. 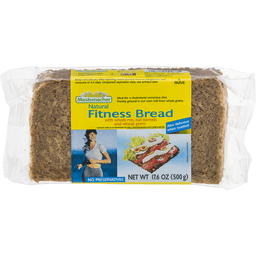 Combining great taste and serious nutrition, Arnold is bread perfected! 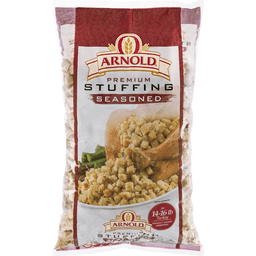 At Arnold, we know how important eating right is to you and your family. That's why every loaf of our Country breads is crafted with nature's finest, most wholesome ingredients and no artificial colors or flavors to help further your healthy lifestyle while always tasting delicious. Choosing Arnold every day is a simple step you can take to support your goal of living well. 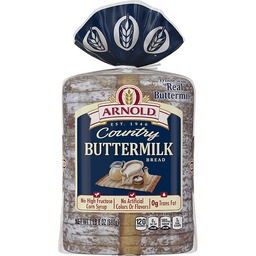 Arnold Country Buttermilk has: no artificial colors or flavors; no high fructose corn syrup; good source of folic acid; 0 g trans fat. 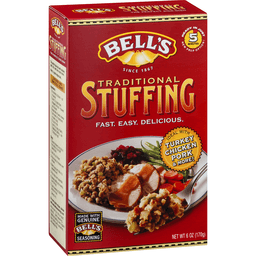 Bell's® Traditional Stuffing. Since 1867. 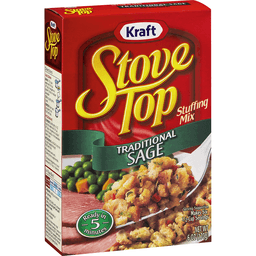 Ideal with turkey, pork, seafood & more. Fast. Easy. Delicious. Ready in just 5 minutes. Made with genuine, Bell's, all natural, salt free, seasoning. Net wt 6 oz (170g). The choice of generations. In 1867, a Boston inventor and amateur cook named William G. Bell created a unique combination of herbs and spices. It was a subtle, flavorful, and truly memorable mixture he simply called Bell's seasoning. Bell's seasoning soon became a treasured staple of kitchens throughout New England. Today, all of Bell's fine products are made with the original spice blend created over 135 years ago! And while our recipes are now ready-mixed for convenient, everyday enjoyment, our commitment to purity, quality, and superior taste remains unchanged. To customize your stuffing, add chopped celery, onions, mushrooms, pine nuts, or any other ingredient you think would be a great addition to Bell's traditional stuffing. Feel free to share you exciting flavor creations with us at www.bellsseasonings.com. Partially produced with genetic engineering. For more great recipes, please visit www.bellsseasonings.com. 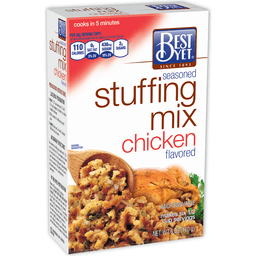 And be sure to try all of our great Bell's products... Bell's seasoning, chicken flavored stuffing, new England style stuffing with cranberries, and meatloaf mix. 1-800-225-5126. 5 grams protein per slice. 11 grams whole grain per slice. Per 1 Slice: 110 calories; 0 g sat fat (0% DV); 180 mg sodium (7% DV); 2 g sugars. Soft & delicious. USDA organic. Barowsky's Organic Oat Nut Bread reflects old-world baking traditions, with 100% Organic flour as our premium quality starting ingredient plus a selection of delightfully delicious pinches from teh baker's cupboard: oatmeal, rye flour, barley flakes, sunflower seeds, oat flour, and others. The consistent care and baking skill required to create this amazingly great tasting, organic bread is a testament to the Barowsky's Organic commitment to the finest quality. Certified organic by QAI Inc. Quality Assurance International. Certified organic. All of our Barowsky's Certified Organic bakery products meet strictly defined standards, guaranteeing ingredients are grown using sustainable farming practices that enhance ecological harmony and rely on nature's balanced systems. 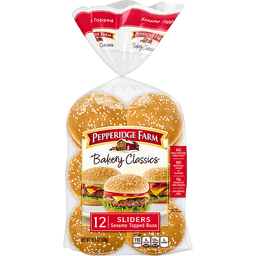 Pepperidge Farm® Bakery Classics Sliders Sesame Topped Buns. New. No high fructose corn syrup. No artificial colors or flavors. 0g Trans fat per serving. Cholesterol free. Per 1 Bun: 110 Calories. 0g Sat fat, 0% DV. 150mg Sodium, 6% DV. 3g Sugars. Net Wt 15.5 oz (439 g). Timeless and without pretense, our "Bakery Classics" stand for quality. With premium ingredients, perfectly orchestrated with a baker's touch. Make your barbecues a little more special with our delicious buns. We hope you agree that our bakers have created a delicious, premium quality bun. Partially produced with genetic engineering. If you have any Questions or Comments, please Call us toll free at 1-888-737-7374. Visit our website at www.pepperidgefarm.com. Now you can enjoy the authentic taste of Vermont Bread, the kind of breads you only used to find at local farm stands and country stores throughout Vermont. Baked fresh from scratch, using stone-ground, whole grain flours and honest-to-goodness ingredients, Vermont Breads give you the great taste and wholesome natural nutrition without those things you don't want; such as chemical additives, artificial ingredients, irradiated ingredients, white sugar, excess salt, and cholesterol. Ther Vermont Bread Company offers you some of the best baked goods you can buy. All our breads are made with care from traditional recipes and a love for baking. In Vermont, fresh homemade bread has always been the favorite gift to give to a friend or neighbor. 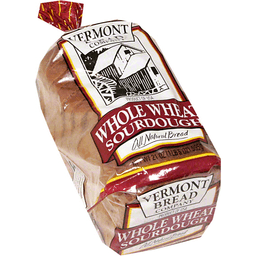 In that spirit we offer you Vermont Bread. Product of USA. 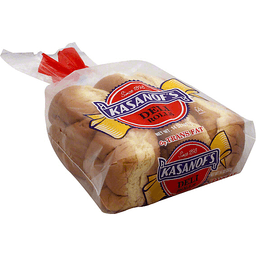 Kasanof's™ All Natural Deli Rolls. Great Taste. Since 1898. Another Quality Product From the Bakers at Vermont Bread Company®. Net Wt. 14 OZ (397g). Over one hundred years ago, Sam and Dave Kasanof began baking bread and delivering it by horse and wagon from their shop on Blue Hill Avenue in Boston. Committed to crafting the best breads and rolls, their motto was, "Don't make it cheaper, make it better." Over the century later, that commitment remains firm. All of our delicious breads and rolls are made without high fructose corn syrup, chemical additives, artificial ingredients, irradiated ingredients, or white sugar. You will be getting the best tasting natural breads and rolls available. Bring your family the taste and freshness they deserve and become a part of this New England tradition, Kasanof's. No High-Fructose Corn Syrup. No Artificial Preservatives Added. No Azodicarbonamide. This Product was manufactured in a facility that processes eggs, soy, wheat, tree nuts and other grains and seeds. Products may contain trace amounts or these items. Try our other fine Natural and Organic breads from Vermont Bread Co. too!. Baked by Superior Bakery, Inc. No.Grosvenordale, CT. 06255. CT. LIC. #2840. Certified organic. USDA organic. No high-fructose corn syrup. No artificial ingredients or preservatives. Baking Healthy Since 1978: Natural & Organic Breads, Rolls & English Muffins: We unconditionally guarantee all of our natural and organic breads, rolls and English muffins. If for any reason you are dissatisfied, return the remainder to us at the address on the package for a full replacement or refund. Please include the name and location of the store where purchased, the closure tag from the package and your reason for dissatisfaction. Certified organic by Vermont Organic Farmers. Eating well never tasted so good! Now you can enjoy the authentic certified organic taste of Vermont Bread, the kind of breads you used to find at local farm stands and country stores. 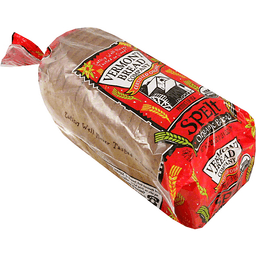 Vermont Bread Company takes great pride in baking our bread with care and traditional recipes that have been handed down through the generations. Baked fresh from scratch, Vermont Bread assures that you are getting superior flavor and nutrition in every bite. Vermont Bread Company supports organic farming by purchasing certified organic ingredients and observing the strict organic process to bring you the highest quality breads possible. Organic products are better for you, better for farmers, and better for the planet. All of our delicious and nutritious organic ingredients are grown without the use of pesticides. You won't find any high fructose corn syrup or artificial preservatives, but you will find the best tasting organic bread available! Thanks. Product of USA. 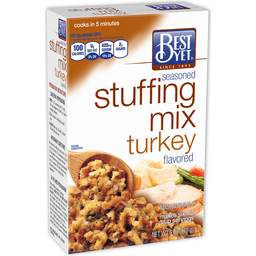 Plain & simple, our plain stuffing mix is and will always be gluten free and dairy free! Love of artisan food. 10 oz (283.50 g)of yumminess. Non GMO Project verified. nongmoproject.org. Certified gluten-free. CSA. Gluten free artisan food. 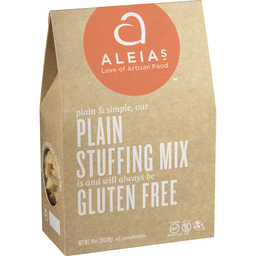 Aleia's is one of the finest producers of certified gluten-free, Non-GMO products on the market. Our founder, a culinary trained chef, conceived each of our quality products from her own gluten intolerance, and her desire to eat great tasting handmade goods that happen to be gluten free. Out of this love and passion for food, Aleia's has created a line of premium products, which has expanded and enhanced the food choices of our customers without compromising taste or quality. We want you to taste something truly special while eating gluten free. Our growing line includes ten artisan cookies, bread crumbs, panko, croutons, stuffing mixes, and breads. You can learn more about our products by visiting our website www.aleias.com, and you can share your story and ideas with us too. We would love to hear from you. Our very best, The Aleia's Team. Gluten free. Dairy free. Non-GMO. Corn free. Trans-fat free. Soy free. Make it tonight! Everything we make is gluten free! Handcrafted and packaged in a dedicated gluten-free bakery facility. Made in Vermont. Now you can enjoy the authentic taste of Vermont Bread, the kind of breads you only used to find at local farm stands and country stores throughout Vermont. Baked fresh from scratch, using stone-ground, whole grain flours and honest-to-goodness ingredients, Vermont Breads give you the great taste and wholesome natural nutrition without those things you don't want; such as chemical additives, artificial ingredients, irradiated ingredients, white sugar, excess salt, and cholesterol. The Vermont Bread Company offers you some of the best baked goods you can buy. All our breads are made with care from traditional recipes and a love for baking. In Vermont, fresh homemade bread has always been the favorite gift to give to a friend or neighbor. 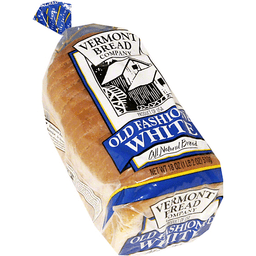 In that spirit we offer you Vermont Bread. Product of USA. For 14-16 lb turkey. Microwave or saucepan preparation. 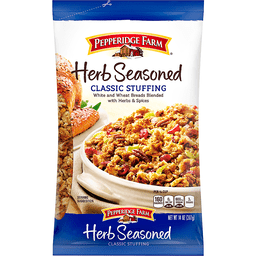 Per 2/3 Cup Serving: 100 calories; 0 g sat fat (0% DV); 400 mg sodium (17% DV); 1 g sugars. 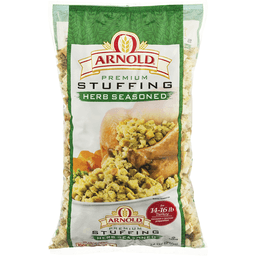 For stuffing that will have your family and friends back for seconds, count on Arnold Premium Stuffing. You'll be proud to call it your own! Create Your Own Recipe: Prepare stuffing according to the directions and add any of the following: chopped cooked giblets; 1 cup sauteed chopped onion and/or celery; 2 cups chopped apples, 1/2 cup raisins and 1 tbsp sugar; 1 cup chopped walnuts or chestnuts; 1 cup sauteed sliced mushrooms; 1 cup chopped raw cranberries. www.arnoldbakery.com. We are committed to providing you with quality products and welcome your questions and comments.